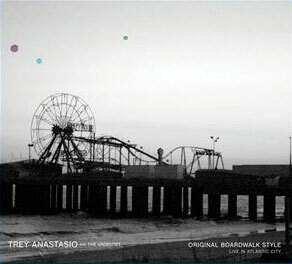 Original Boardwalk Style, a live album from Trey Anastasio and the Undectet, will be released on June 10th on Trey's own Rubber Jungle Records. Proceeds from the sale of the album will benefit the Seven Below Arts Initiative, established by Trey in 2006 to foster artistic development and support arts education in the state of Vermont. The album was recorded at the House of Blues in Atlantic City, NJ on December 30th and 31st of 2006, coming at the end of the band's holiday tour. The two shows marked the culmination of a long year of touring and growth as what began as a six-piece sextet in the beginning of the year had progressed into a full-force eleven member Undectet. The raw energy of a well-oiled band at the top of its game permeated the set as the composer/vocalist/guitarist led The Undectet - comprised of Tony Hall (bass, vocals), Ray Paczkowski (keyboards), Jeff Sipe (drums), Christina Durfee (vocals, synthesizer), Jennifer Hartswick (vocals, trumpet), Peter Apfelbaum (saxophone, flute), Russell Remington (saxophone, flute), Jeff Cressman (trombone), Dave Grippo (saxophone) and Cyro Baptista (percussion) - through electrifying big band arrangements of his classic songs, replete with big horns and dazzling Brazilian percussive stylings. Original Boardwalk Style features over 75 minutes of music, remixed from the multitrack masters by Trey and Ben Collette at Rubber Jungle Studios and mastered by Fred Kevorkian at Kevorkian Mastering. In addition to CD and digital download formats, the album will be available as a double-gatefold, audiophile grade 180-gram LP Vinyl pressing. The album is now available for pre-order as CD and Vinyl Trey's online store as well as digital audio downloads (in both MP3 and FLAC formats) at LivePhish.com. All pre-orders will automatically be entered to win a professionally printed photo - signed by Trey and esteemed photographer Jeff Kravitz - of the band on stage at the House of Blues. Color corrected by Jennifer Brown, it will be framed in barn board crafted by Lars Fisk, a creative contributor to The Barn's Artist-in-Residence program. Ten runners-up will receive autographed copies of the vinyl.